The beauty of running a race in the city that was my home for 20 years, and where I still work to this day, is that most of the race course is very familiar. Will that make up for the length of the race, which for me will be a record-breaking 34km (a distance I had never even done in training)? 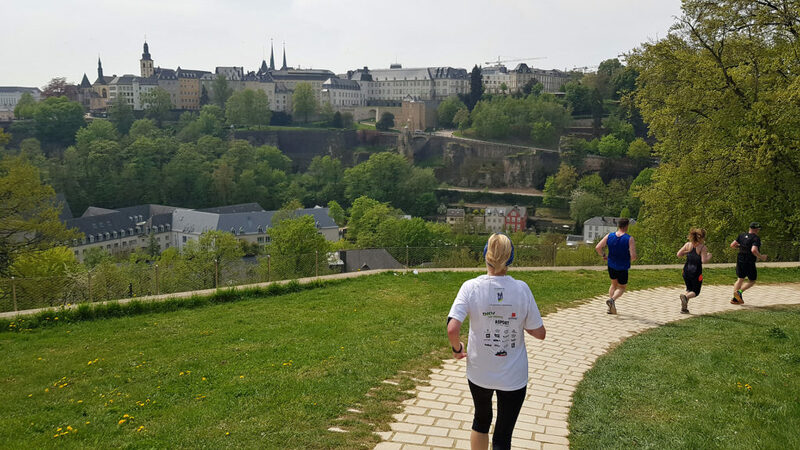 The DKV Urban Trail in Luxembourg city had been on my radar for many years. I had covered it several times for the newspaper, also back when the race format was still that for an Ultra with over 50km. Over the past years, the race organizers had shortened the longest distance to 34km, and added 18km and 27km options to the popular 13km race. So this year, when I was looking for a race in April that could serve as a preparation race for my big summer goals, I decided that the Urban Trail was a good option. I just had to settle on the distance. 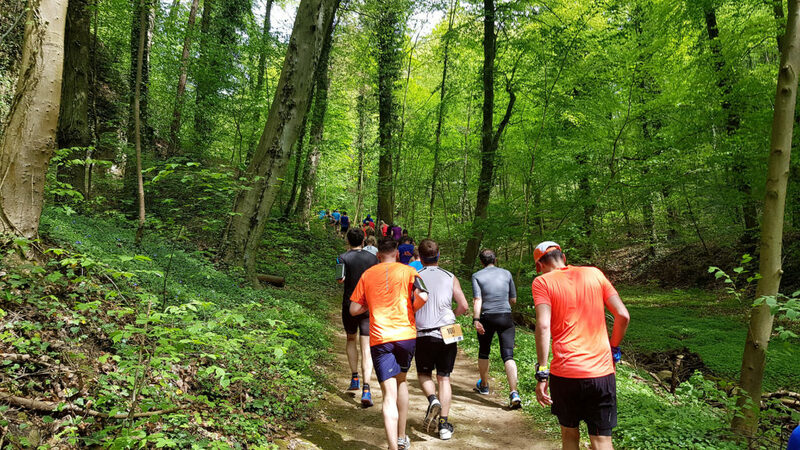 Not surprisingly, I ended up choosing the longest 34k option – first and foremost because a 3+ hour outing is a better preparation for a marathon in the mountains than a shorter race; but also because I like a good challenge. 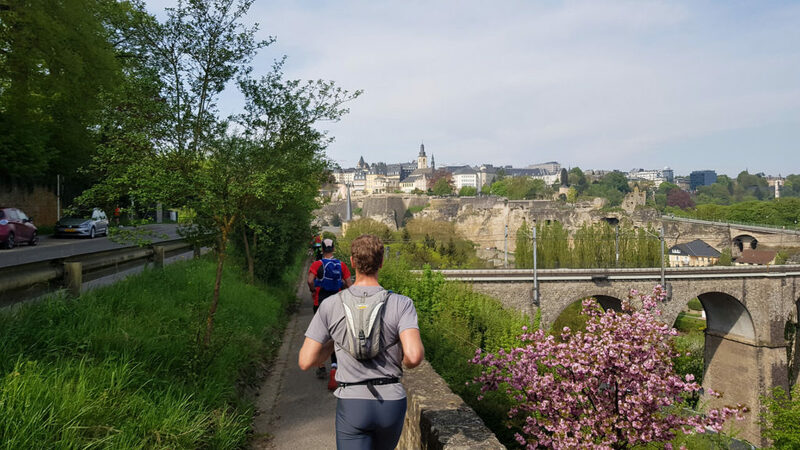 With a race course that starts just next to my workplace and the luxury of having a few days off work in April, I was able to do reconnaissance runs not just on the urban parts of the course in Luxembourg-City, but also on the trail part on the outskirts of the city towards Hesperange. 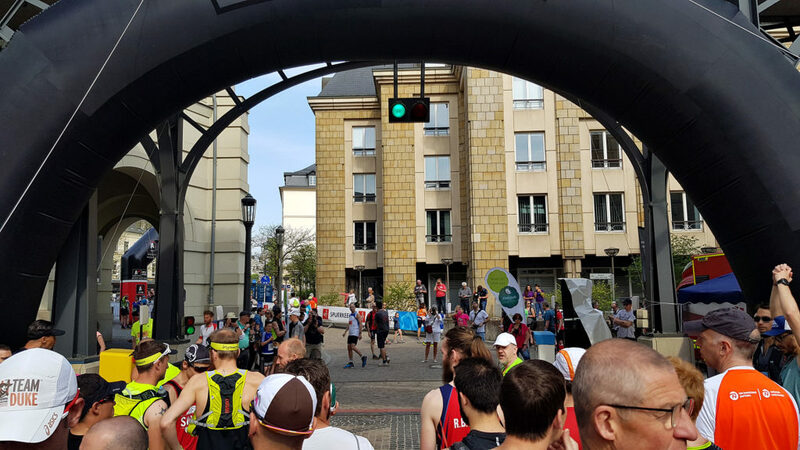 I’d estimate that I covered at least 90% of the course at least once, and some of the segments along the Alzette had been part of occasional run commutes all throughout the early months of 2018. Since late 2017, I’d gradually increased my monthly running mileage, up to around 200km on average. Most of my running was on hilly (but not mountainous) terrain, which also served as good preparation for the Urban Trail with, officially, 655m of elevation gain. As the race drew closer, and weather predictions were starting to get a little more confident about several dry and hot days leading up to the race, it was time to settle on equipment choices. 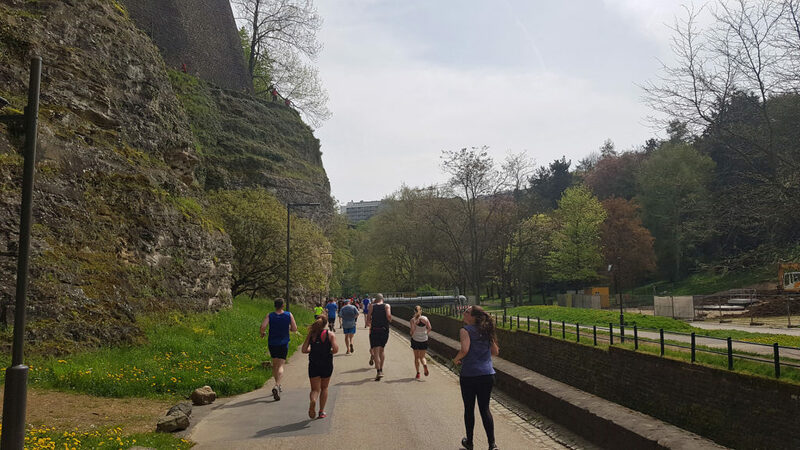 A large part of the course is on dirt trails (some single trail, some wider), with a bit of running on pavement as well as cobbles and stone stairs. 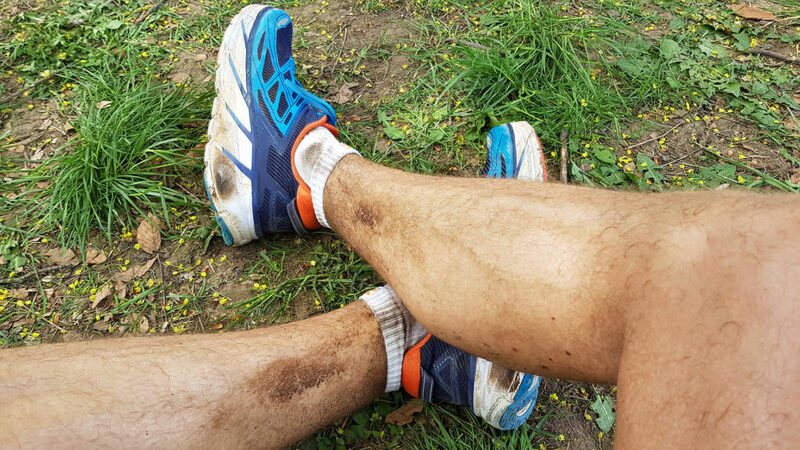 I was confident that due to the dry weather, trail running shoes with an aggressive thread would not be required. I did want to have quite a bit of cushioning in my shoes due to the much longer nature of the race. So in the end, the decision was against my Salomon Speedcross 3 or 4, against my ageing Hoka One One Challenger ATR 3 trail shoes, and in favour of the Hoka One One Clifton 3 that I’d previously used only on shorter runs. A few training runs on the race course confirmed that their thread was more than adequate. Then came the decision for or against a running backpack. Temperatures of up to 27°C were predicted. A race vest or running backpack would further increase the perception of heat and I certainly didn’t need to carry any emergency cold-weather gear. While warm weather meant I’d need to keep hydrated, the race has a fairly high amount of of aid stations so in theory I wouldn’t need to carry anything. In the end, I decided on a kind of in-between solution: I’d leave the race vest at home, but stash a 0.5 liter soft flask in the large back pocket of my running shorts. That way, I’d be able to run in just a shirt with no additional weight on my shoulders and back, and yet be a bit more independent from the small cups of water server at the aid stations. Out of the five distances offered, comparatively few people had signed up for the longest race. 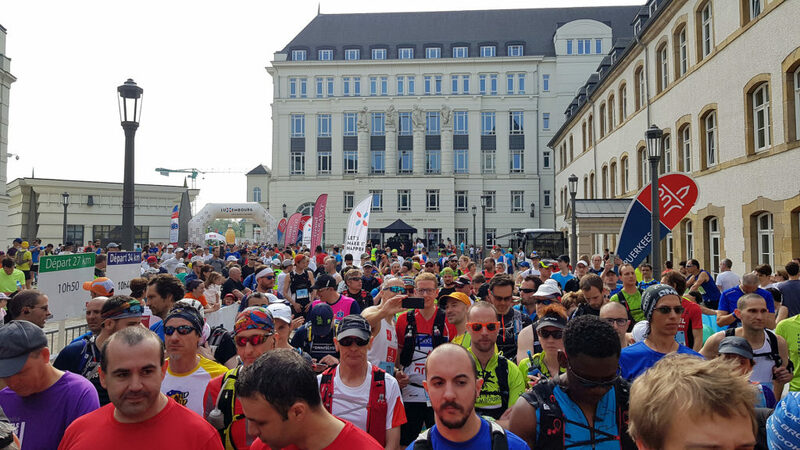 Less than 300 competitors are lining up outside the Cité Judiciaire, which during the week is home to the courts and tribunals of Luxembourg-City. At the 10:40 race start, the temperature was already past 20°C, but with a slight breeze that made it manageable. I settled somewhere in the first third of the starting grid, keeping a respectful distance to the top runners which I know will bust out a few fast kilometers on the first easy kilometers of the course. My goal is to keep my heart rate in check early on. 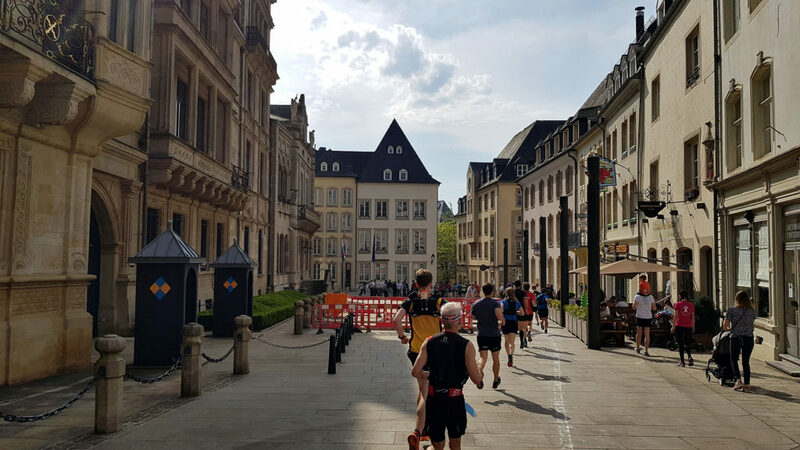 The gun goes off and we start with a 1.5km loop of the Upper City, past the Monument of Remembrance (“Gëlle Fra“), through the pedestrian zones of the Upper City, past the Grand Ducal Palace. 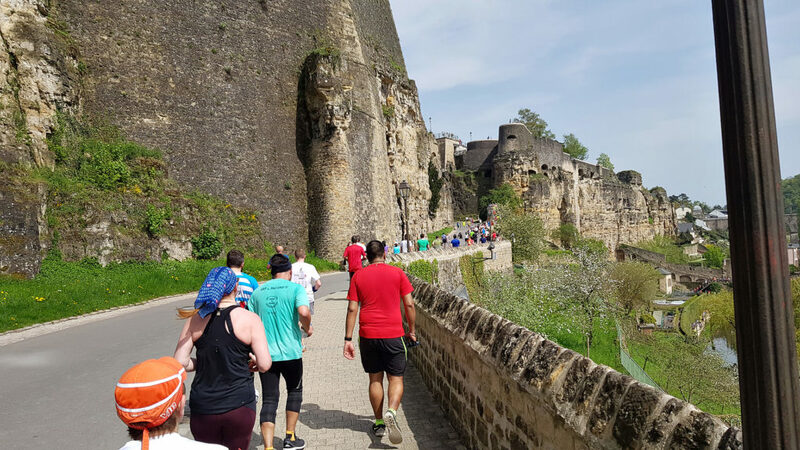 We hit cobblestones as we pass the National Archives and then join the Chemin de la Corniche, a scenic path overlooking the old quarters and fortifications of the Grund quarter in the Alzette valley. Two kilometers have passed, and I am cruising along at 5min/km pace with a heart rate already past 160bpm. I don’t want to go much higher than that. Next up is the first real climb of the day, up the Kosakestee stairs. I’ve done these a lot for training, even back when I was still a sprinter 20 years ago. 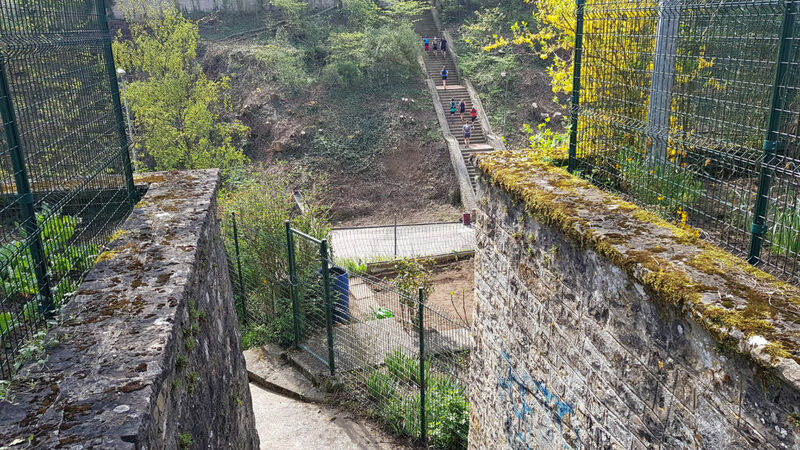 Over the last two or three years, I’ve had more and more trouble running up these irregular cobbled stairs with a semblance of speed, so in a bid to save some energy I speed-hike the majority. 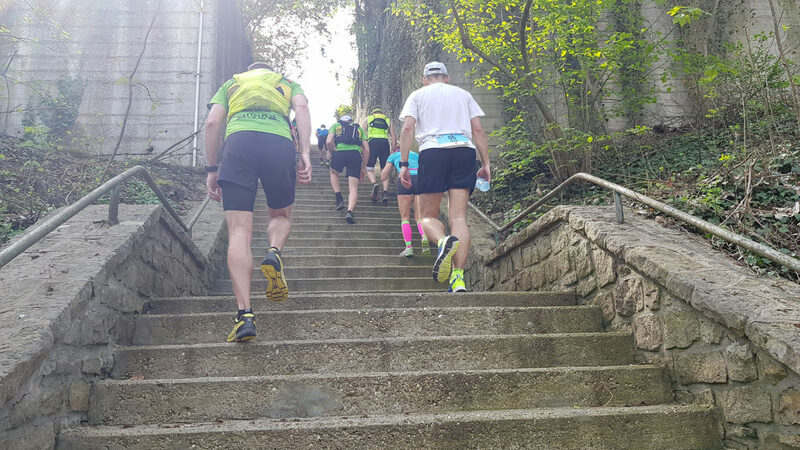 My average pace, what with the aid station stop and the stairs, suffers – km4 took 6:50min. 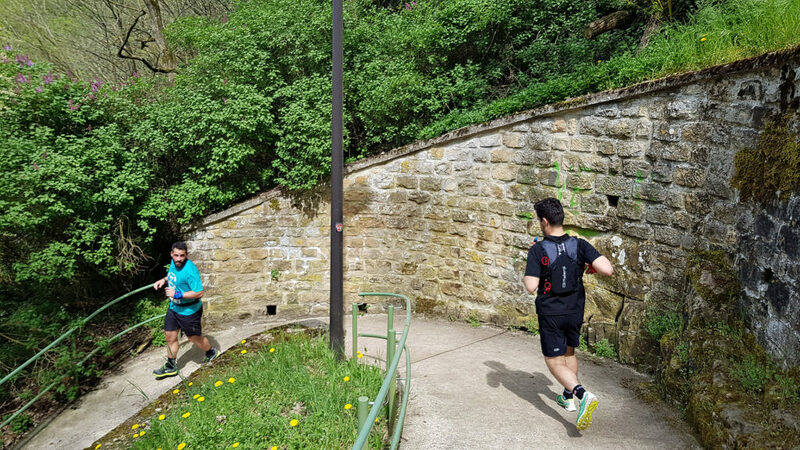 I still pass a few competitors here, also because I know that after the stair climb there is an easy straight descent where I can recover a little. After the descent, we are now at the Plateau du Rham, which we enter via the often-photographed Tour Jacob, another fortification relic. Nowadays, this place is most well-known for housing a retirement home; and a couple of its inhabitants are outside, enthusiastically cheering us on. We run back down over cobbled stairs that were built when people didn’t have size 47 shoes, across the Bisserwee and then over the Alzette river on another fortification wall and bridge, and through the Grund quarter for another quick loop, over Münster bridge that offers a nice view back up at the Upper City and the Corniche which we’d run over not long ago, past Scotts Pub and then we hit another aid station on Bisserwee, a little over 5km into the race. I skip this one. From here, the Urban Trail briefly joins the route of the PC1 cycle path along a temporary (several years long) detour around a railway construction zone, then past another big construction zone at Pulvermühle, where old industrial buildings are being torn down and a whole new living quarter will be created. This part is mostly flat and I go back to a 5min/km pace. 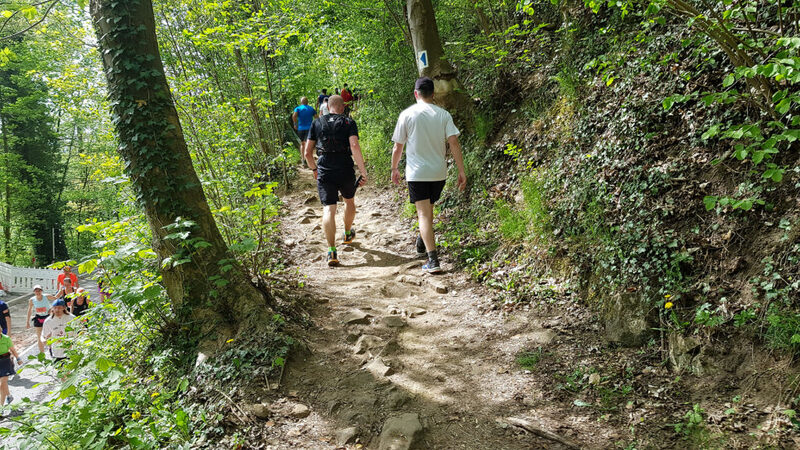 With 6km behind us, we cross the N2 national road where police have stopped traffic for us runners, and then hit dirt for the first time to climb up quite steeply into the Durensbësch forest. This is pretty much a narrow strip of woodland that delineates the Verlorenkost quarter to the south, and beyond the initial climb the trail is wide and easy. Back when I was a kid I used to play here, and the forest seemed a giant playground. 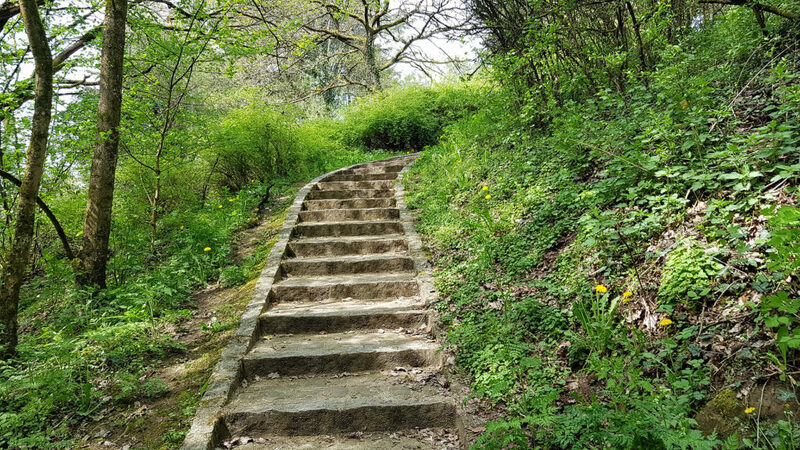 Nowadays, it appears quite small and soon we hit more artificial stairs, first up then a couple more on a downhill stretch. At around 7km of distance, the first 27km runner who started 10 minutes behind us flies past. About 7.5km in, down a few more stairs we go, then across another major road (CR225) where once again car traffic has been stopped. After the crossing, another big set of stairs awaits. I pass a few more people on this climb – it’s becoming a recurring theme that I’m either the same speed or maybe even a little slower than those around me on the straight bits, but comparatively stronger on steeper bits. 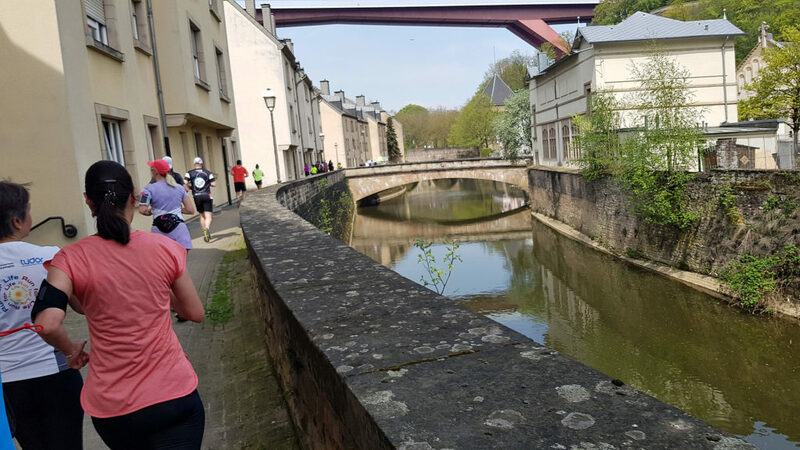 We run through the outskirts of the Bonnevoie residential quarter, on a sidewalk with houses to the right and a thin line of trees to the left. The second 27k runner goes past. With 8km now done, we’re looking at a last descent on road surface before hitting a long stretch on forest trails. I decide to increase my pace a little, and manage to get down to a 5:06min/km here at the expense of hitting a 167bpm heart rate average. 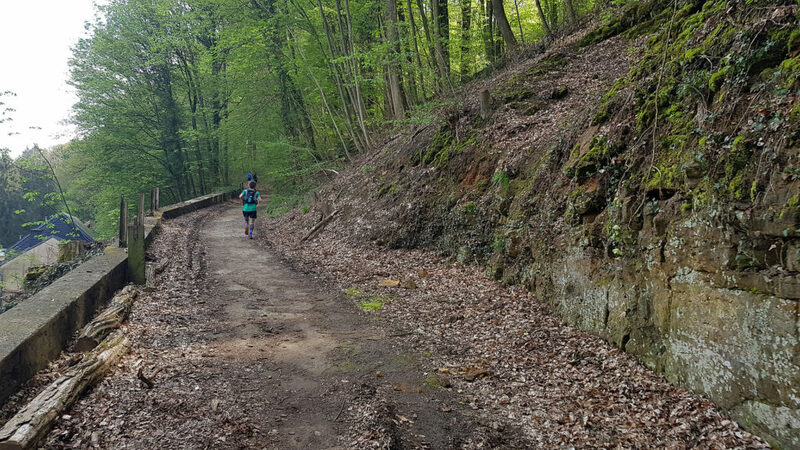 Just before reaching Schleifmillen, we take a dirt path to the right, into forest that surrounds the meandering Alzette river. For the next hour, we’ll be going up and down in these hills, sometimes taking a trail up only to go back down a hundred meters later, even though there’s a perfectly flat trail we could use instead. After crossing Rue Anatole France, a dead-end street with no traffic, the watch finally beeps with the information that I’ve covered 10km. My cumulative time at this point is 55:14. For a while, I’m running behind an older runner with only one arm, and I wonder how much more challenging this race is for him, even for mundane tasks like being able to easily unscrew a water flask. Km11 sees the first “up then down” detour. I know from my training runs that while these detours will break my rhythm and obviously slow me down versus just continuing along the river, they’re inconsequential enough that I’m able to keep running them. The increase in heart rate will be followed by a quick recovery on the descent back down. Not walking on the uphill and pushing the downhills means I move up a few positions here. For the record, at each of these anti-shortcuts there’s a race volunteer to make sure that people don’t “forget” to run the entirety of the race course. Shortly afterwards, we get to the third aid station. Just before, at a conveniently-located trashcan, I throw away the wrappers of the two gels I’ve consumed up to this point (the plan was to take 4 of them with me and eat them at the 30min, 1h, 1h30 and 2h marks) and unscrew my water flask so the aid station volunteer can fully refill it. I’ve consumed 0.75L so far. Rue d’Itzig crosses our path. 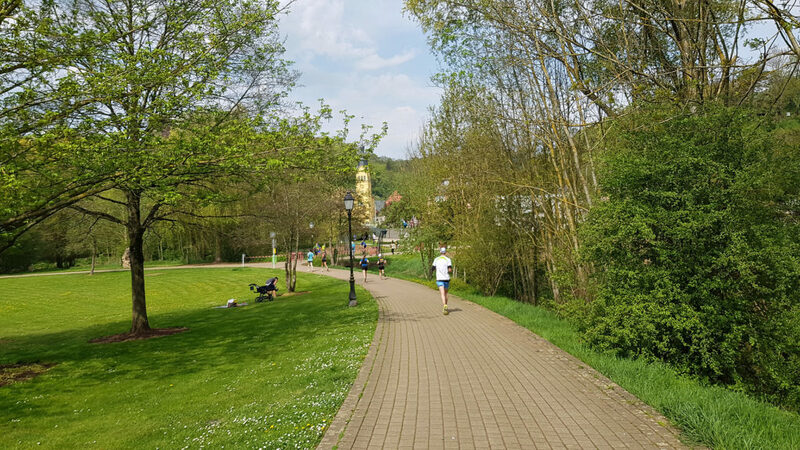 The 27km route crosses the river here and turns back towards the city, but us 34km runners will soldier on towards Hesperange. Once more the cars are being stopped and we can cross the road safely and efficiently. While I was waiting for my water flask to be refilled at the aid station, I was passed by one or two people with no need for water, so after I cross the road I set out to catch back up with them. I do so on the next anti-shortcut, which is a little longer than the first one. I still run it rather than walking, which sends my heart rate up again. I know that I will be able to recover on the descent, but my heart rate ends up dipping a little more than I wanted since on the somewhat narrow single trail I am slowed down a little by a runner in front of me who is descending more carefully. Slowly but surely we’re making our way towards Hesperange. The first signs of civilisation appear again after 13km are covered. The realization hits me: “only another half-marathon and I’m done”. Or was it: “still another half-marathon before I’m done”? With 21km still to cover, I’m still feeling mostly fine; but even though the trail ends here and the course briefly turns back to pavement, I’m no longer capable of running a fast 5min pace, but am closer to a 6:00min/km now. Another slightly faster kilometer later (5:45), the A1 motorway bridge towers high above us. 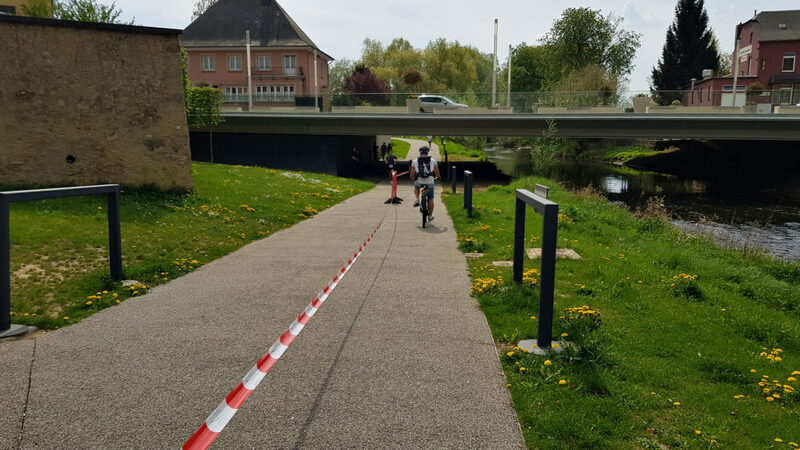 We cross the Alzette river and I get my first course surprise. Rather than joining the PC1 cycle path like I’d assumed we would, we head back on a single trail that I wasn’t aware even existed and that parallels the cycle path. It’s not a huge difference in distance or elevation, but still a bit of a surprise – I was looking forward to an easy kilometer on pavement and get a narrow single trail instead. We do join the PC1 path a little later so we can run below the bridge of the N3 road. 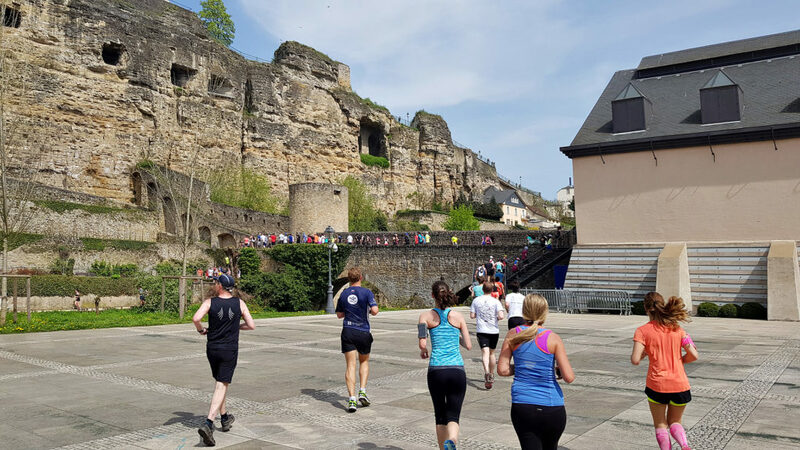 With the Hesperange church and castle on the right side, we’re not to far now from the Hesperpark, which at around 15km of race distance is both the fourth aid station and the turn-around point. 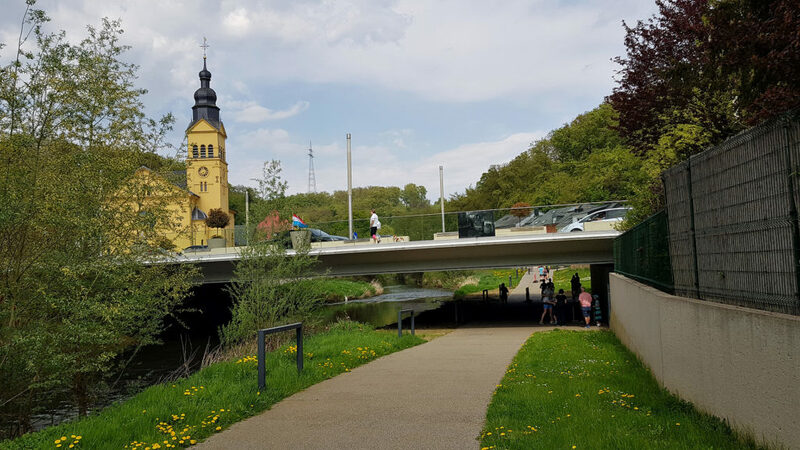 From here, we’re going back towards Luxembourg-City; albeit save for the short stretch back under the N3 bridge the course will be entirely different. Once more, I ask for the aid station volunteers to refill my water flask (1.25L consumed). While I wait for this to happen, I am once again passed by people who don’t stop. 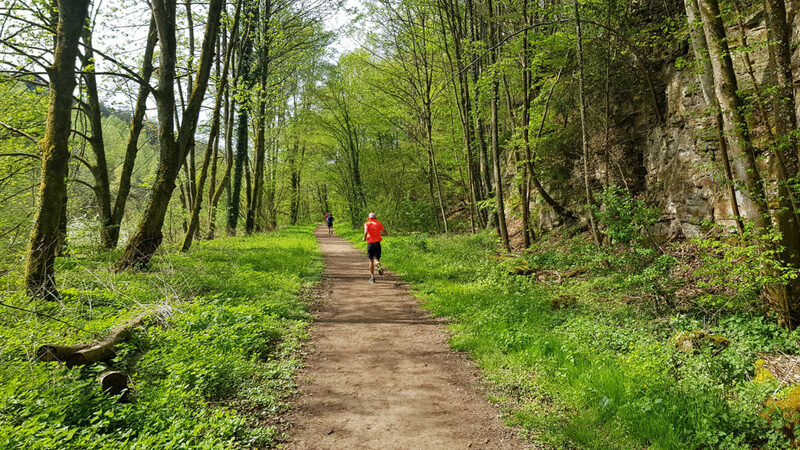 After crossing under the N3 again and a glimpse at the competitors who still need to do this little Hesperpark loop, we’re once more climbing on a forest trail towards the Holleschbierg sports complex. This one’s looking fairly innocent but is quite tiresome. I revert to a walk on the worst part. My Garmin tells me I’m hitting 188bpm heart rate, which I’m not sure my body is even capable of. [I’d later realize that while I was wearing my HRM-Run heart rate monitor around my chest, I’d deactivated it on the watch, which meant that the watch was using its optical wrist-based sensor instead; which tends to be less reliable.] Once again [even if it was inflated by a few beats] I knew that the impact on the heart rate would be short-lived. After a brief level stretch along the sports complex where I’d often been on sports assignments, we descend back down into the forest. A race volunteer is instructing us to “take it slow, it’s a steep descent”. 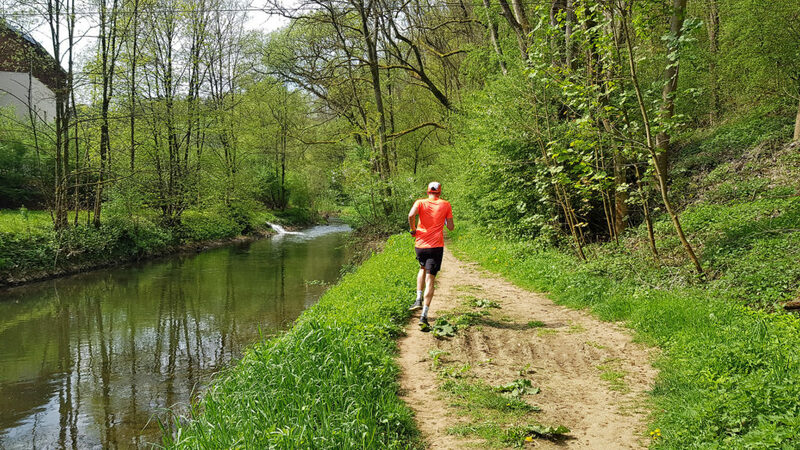 I quip back that usually “taking it slow” is a very easy option for runners, one we can always fall back on [the reply was less verbose in my own language]. Needless to say, km16 was fairly slow (6:51min/km). The next kilometers are undulating through the forest. We cross under the A1 motorway again, and head away from the river into the forest. I consume my third gel and am able to recover a little more. On a fairly steep descent back down to river level, I’m able to catch up with the woman who is in third position. She’s descending much more timidly than I am, but once we hit pavement again at the bottom of the hill she’s speeding ahead again. Back on the PC1 cycle path along the river. Third-place woman ahead of me. I’m almost at km19 now, and have already consumed my entire half-liter bottle. 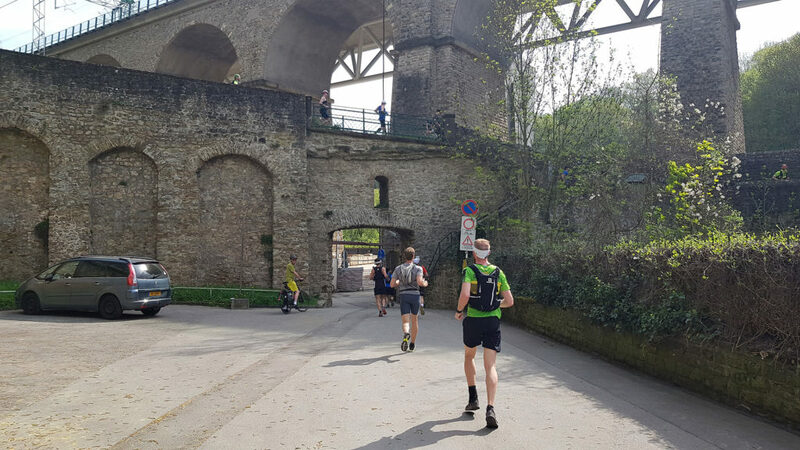 Unfortunately, the point where we cross the Rue d’Itzig again (on the opposite side of the river) there is no aid station. I could have gone to the one across the river, but that would have meant quite a bit of wasted time and distance. So, no option but to press on. From here, we are back on the same course that the 27km runners take. 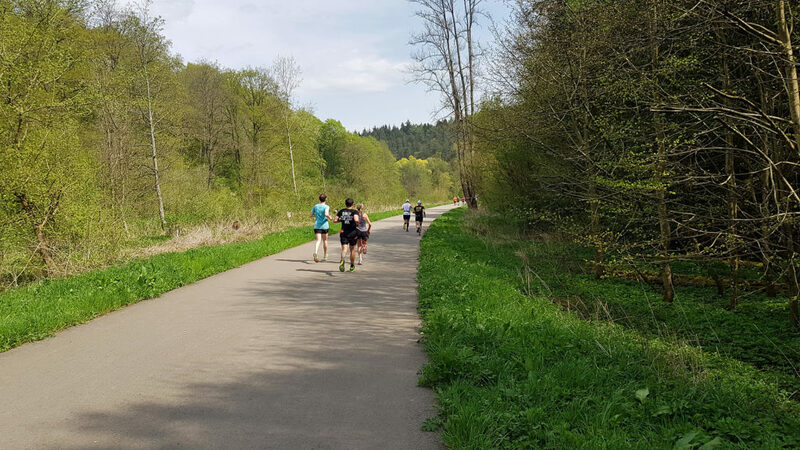 They started behind us, but since they didn’t do the 7km loop towards Hesperange most are now ahead. Right after the road crossing (again, cars are stopped), there was another killer climb on a single track. My unreliable heart rate monitor spikes to an even more improbable 191; as I catch another runner or two who are using a more conservative uphill pace. Km20 is mostly downhill through the forest and then on pavement along the river. I manage a 5:18min/km pace. To the left, the eye catches the large yellow structure of the derelict Gantebeensmillen. 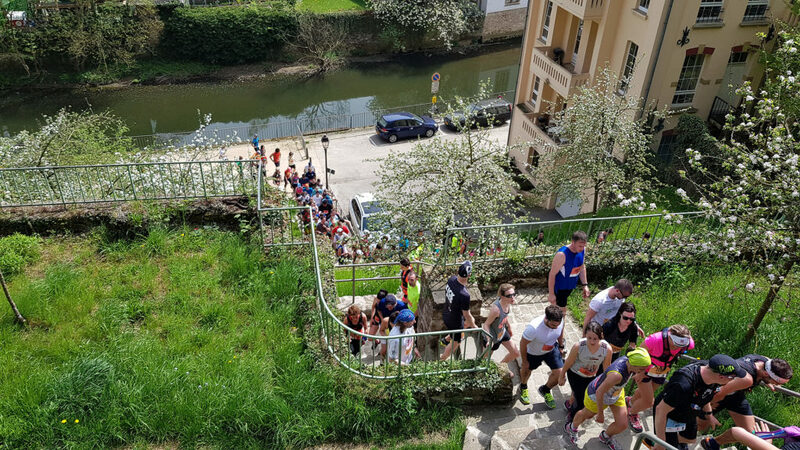 To distract from this former swimming pool and restaurant that is now little more than an eyesore, the race offers… another anti-shortcut. We climb back into the forest, on a trail I often use during my lunch runs. 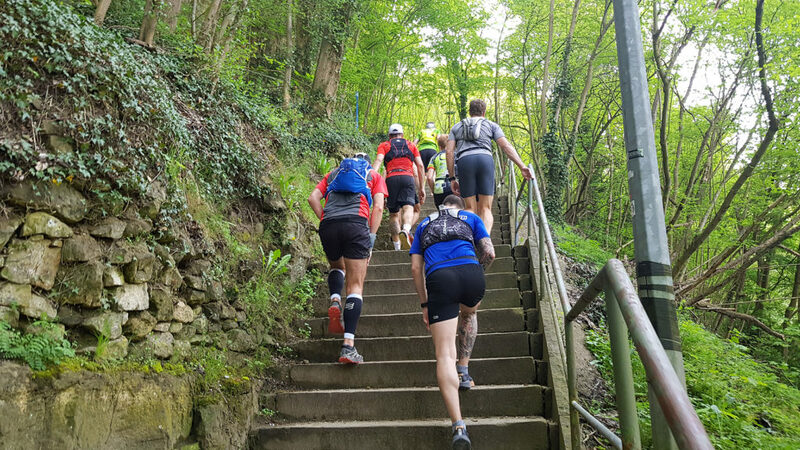 We climb up on a single trial, descend again almost immediately still on single trail, run up some concrete stairs, run down a paved side street, only to rejoin the cycle path a few hundred meters down the line. 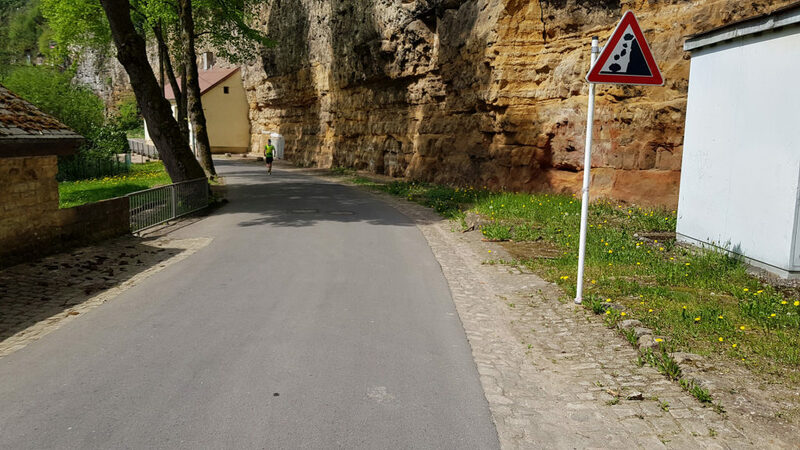 We head on, with a sheer rock face to the right, the river Alzette to the left, and through the short tunnel formed by the buildings of the Atelier Schleifmillen, an artist retreat. And of course, what comes next? 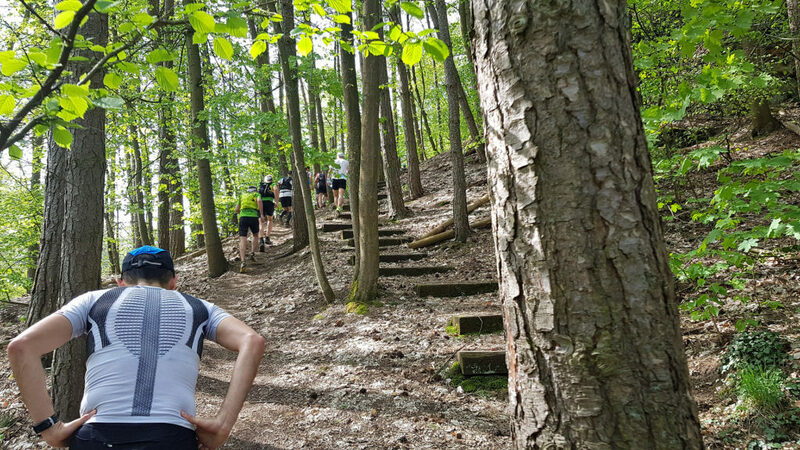 Another stair-climb into the forest. This one is a little tamer – it doesn’t climb all the way up to the top of the hill but joins a single trail half-way up. Traffic has markedly increased with the slower runners from the 27km race now in front of us. The trail is mostly single-trail, but forgiving enough to squeeze past slower competitors. So that’s what I do. After being slowed down on previous kilometers either by climbs (7:04min/km) or the need for water (6:26min/km), this is once more a faster stretch (5:23min/km). Catching up with so many people gives me a bit of an adrenaline boost, but of course the disadvantage is that these slower runners will often stay on the ideal line, sometimes not even aware that someone faster is coming up from behind; forcing me on more uneven ground to go past while hoping that they will not do any sudden movements into my very narrow impromptu passing lane. After passing CR 225 at the Val de Hamm, traffic gets a lot worse. Here, the mass of 18km runners join the course. 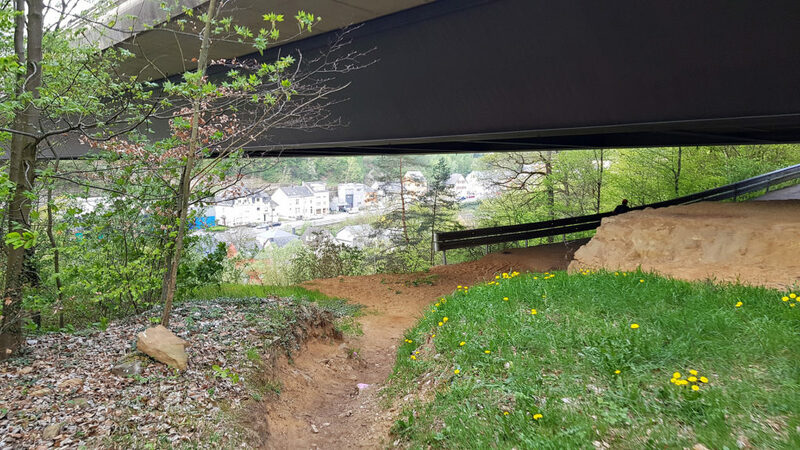 Unfortunately, shortly afterwards, we take yet another anti-shortcut on single trails that climb into the hills overlooking Rue de Pulvermühl. Most slower people are fairly responsive when I call out “on your left” , but as usual in Luxembourg you never quite know which language to use. 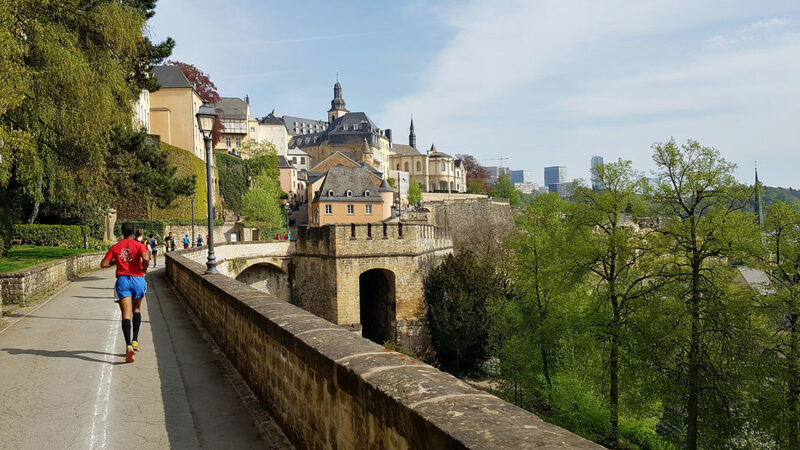 Luxembourgish would be a given, but considering how many French-language people live, work and run in Luxembourg and who only speak French, maybe telling people in French, “je passe à gauche” would work just as well. My pace isn’t too great here. The issue isn’t just the climb or the traffic, but also because I’m bonking a little. 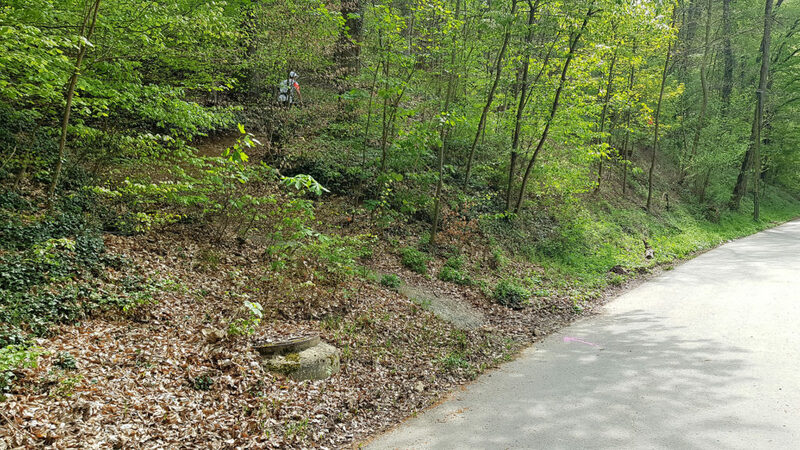 Next comes a steep descent on switchbacks back down to Pulvermühle; where once more police are stopping the car traffic on N2 to let us cross. I half-expect them to stop us runners to let the cars through just as I approach (it is a major road), but I luck out and get across without having to stop. A quick climb back up on the other side of the road, and we briefly rejoin the bit of PC1 that we’ve taken on the way out. The 2-3 2-3 meters wide PC1 is congested with runners. I have another moment that makes me chuckle: one of the slower runners who noticed me going past yelled out in French, “coureur!” (“runner”), to warn people ahead to make room. I seldom associate myself with being fast enough for other runners to make room for me, this seems out of place. I turn my head around, remarking, “but aren’t we all runners?”. We pass Scotts Pub on our left, leaving behind the PC1 leg that was used in both directions. 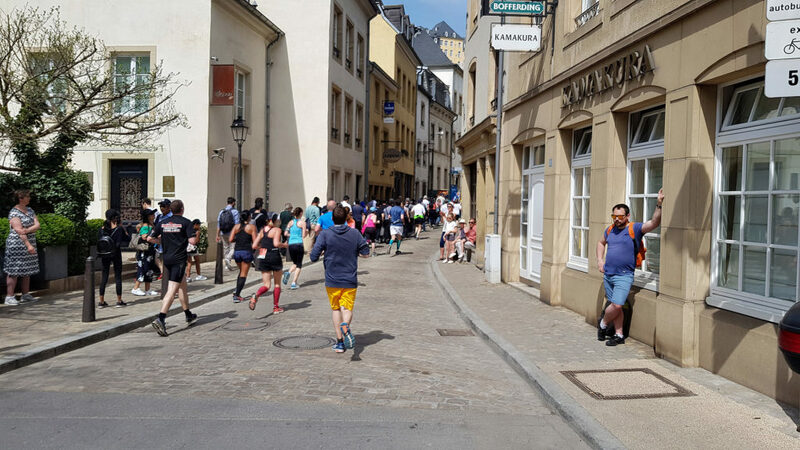 But I no longer even need to look for route markers, I merely follow the hordes of people – by now we’re on the part of the course that is shared by all other races, including the 13km which was started in several waves to reduce congestion in key points. It doesn’t help much. 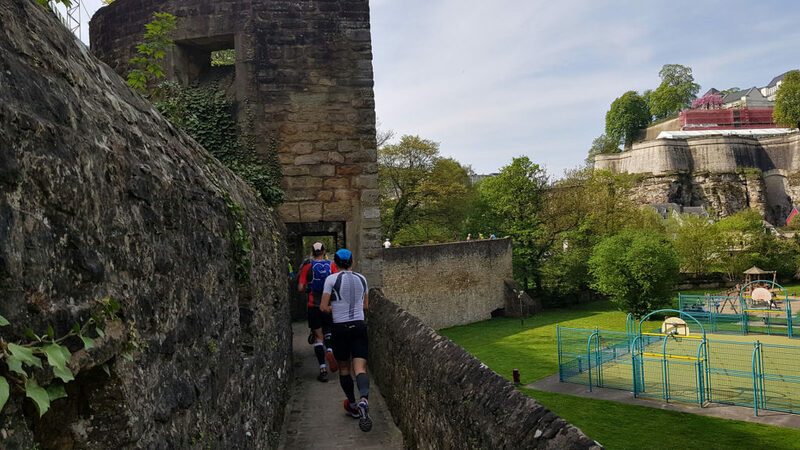 We run through the court of the Abbaye Neumünster, then across the familiar Stierchen bridge before taking a different route up towards Pont du château. This one leads over a set of stairs that is full with people. 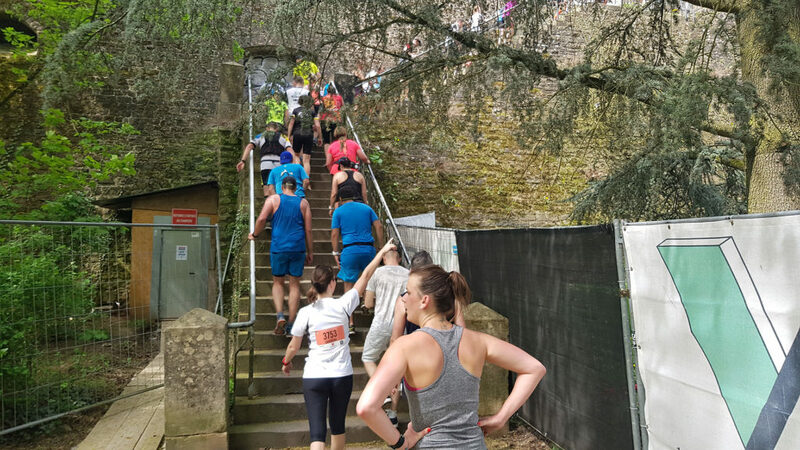 I end up using the grass to the side, then climb on a wall to the side, so I’m not blocked behind the mass of slow runners inching their way up the stairs at a glacial pace. The same experience would repeat a little later, on a set of iron scaffolding stairs supposed to separate outgoing from incoming traffic below Pont du château. 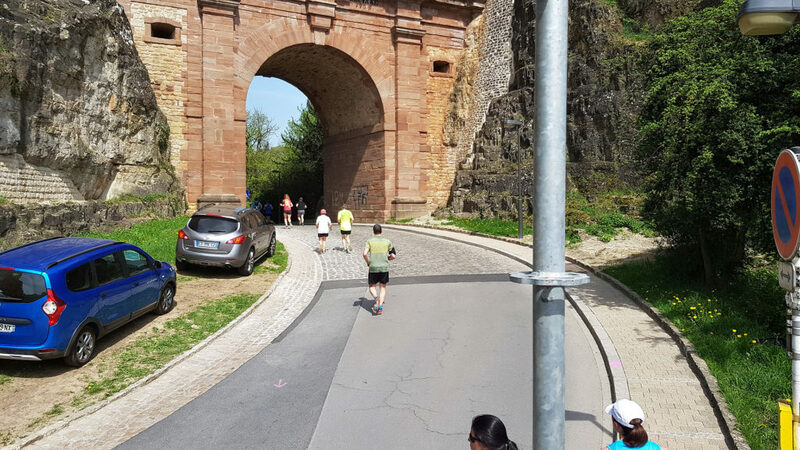 But at this point in the race, there was no outgoing traffic here anymore, so runners were needlessly corralled onto the bridge to go over non-existent traffic going the other direction. The stairs as such wouldn’t have been a problem, but the people going 1km/h on them were. 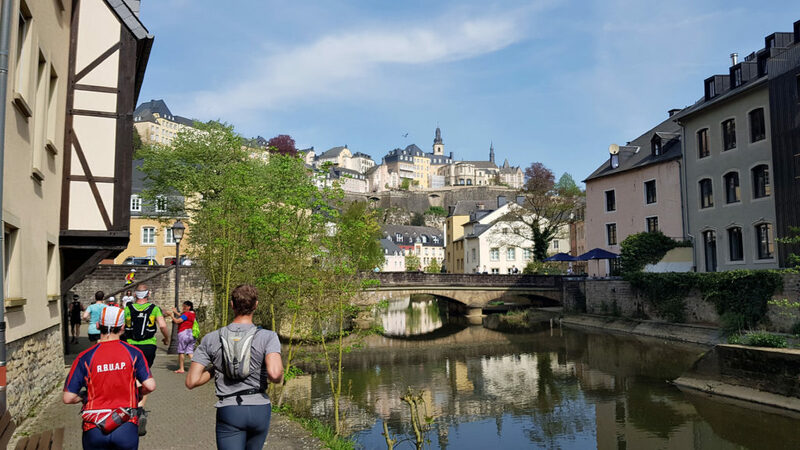 Next, we run downhill past the Youth Hostel (where I finally consume the last gel of the four ones I’d brought), cross the Alzette river again and then start a very incremental climb up Rue Jules Wilhelm. It’s at this point that I decide that I’ve had enough. Why didn’t I sign up for the 27km instead? (“If you lived here you’d be home now” says the cliché American realtor advert.) I was getting increasingly annoyed with other people. I felt that I was moving slowly and falling apart, but still moving much faster than people around me. At this point, it would have been more motivating to just be surrounded by 34km runners; because that way there would be more of a fight still going on for positions. Here, I could pass fifty people or get passed by a fifty people, and yet maybe not make a single impact in my 34km final result. On km27, excessive traffic and/or the climbs slowed me down considerably to a 7:12 min/km pace. On Km28, we went under and around Tour Malakoff. At this point the road steepens, and then after we go around another corner there’s a single trail forest path leading to the Kirchberg plateau. This turns out to be the slowest most frustrating climb of the entire race. Even though I walk for a bit, I easily stay with most other “runners”. On the steep single-trail part I’m almost coming to a stop. Some woman runners are frustratingly slow, and not respecting runner’s etiquette: half of them have headphones on their ears and are oblivious to the world around them, others are chatting up a storm among themselves and are also oblivious to the world around them. My take is that if you’re in a race and on the steepest part of the course; if you have enough energy to chat then you’re not going fast enough. But that’s just me. 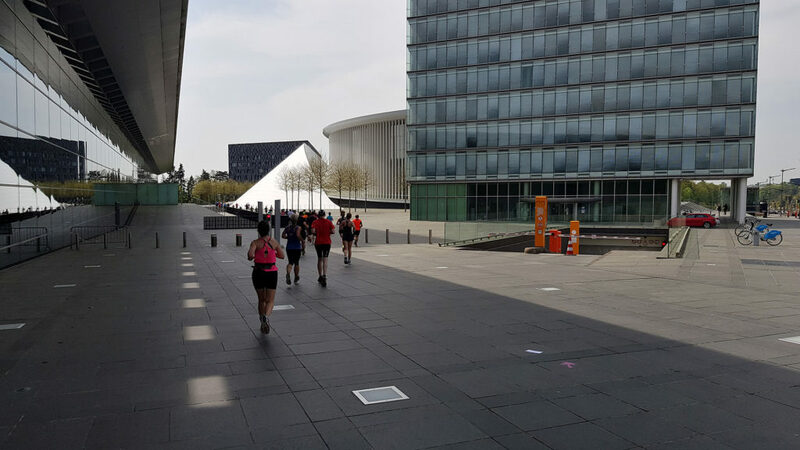 The course loops around the large building of the International Conference and Congress Center, then descends back down towards Park Dräi Eechelen with the extravagant Philharmonie concert hall on the right side. Here, I glimpse a sign indicating how many kilometers are still left for all racers (the first one I’ve seen on the entire course, for that matter). A couple of 13km racers next to me seem confused because the number looks off, but I reassure them that as far as I know the course is a little short. 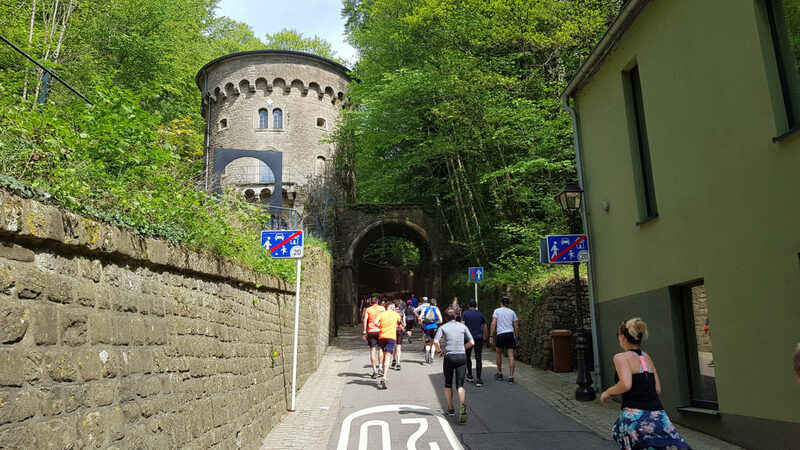 We run past Fort Thüngen, then across more fortification ruins before heading into Parc Niedergrünewald. Here, I have the second course surprise for the day, for the marked course takes a shortcut when there was a detour available (which I’d always taken on my reconnaissance runs). 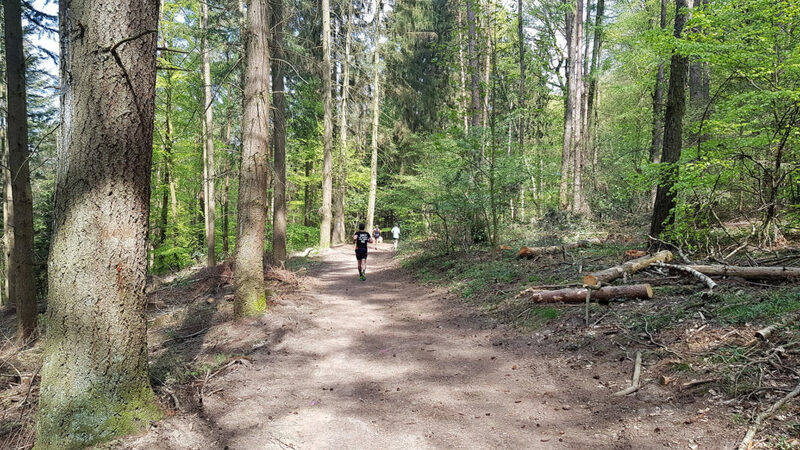 Similarly, through Parc Niedergrünewald the course once more opts to skip an extra climb and go an easier route; which seems a little inconsistent with the gratuitous nature of anti-shortcuts on the rest of the 34k course. But at this point in the race, with my legs seemingly made of lead and my head yearning for the finish line, I’m not complaining that the route has become more straightforward. As we descend into Pfaffenthal, I briefly chat with the woman in 4th position. We’ve traded positions all along the aid stations thanks to her carrying more water in her running backpack. My pace on this downhill stretch has improved again, down to 5:37min/km, but when she goes ahead to chase the 3rd-placed woman I don’t have the energy to follow. 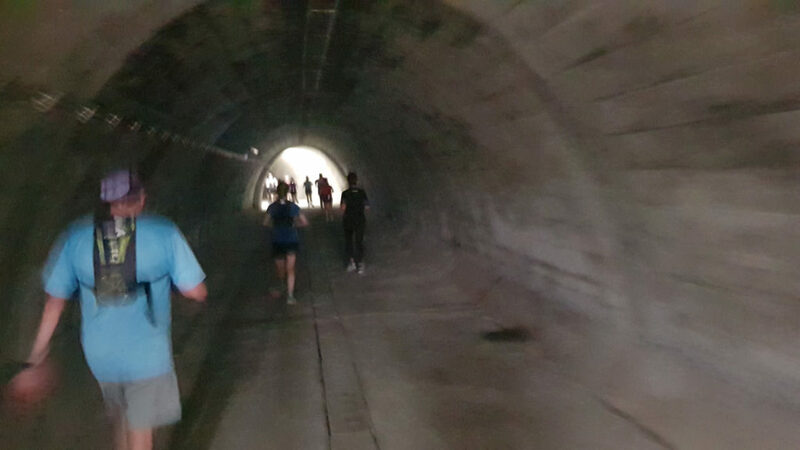 After 31km, all runners the “water tunnel” that traverses under the entire upper city. Usually it is closed to the public, so this race is one of the only opportunities to see the tunnel. It’s fairly dark and in a few spots you can hear water rushing down. In another spot it sounds like you can hear vibrations from cars or some kind of machinery above, but maybe that’s an illusion. At the end of the tunnel there’s a few stairs before the exit into the Petrusse valley. Those handful steps almost seem like an insult. I really wish I was done. But first, a few hundred meters along the Petrusse valley, and then comes the final climb back up to the upper city. An old friend who’s spectating encourages me to run all the stairs, but I don’t have the energy. Also, once more there’s so much congestion that even if I had wanted to run the stairs, I wouldn’t have been able to. I try to zigzag around the slowest people on my way up. Finally, the Notre-Dame Cathedral comes into view. I’m finally done with climbing. Now, for the final “sprint” across the finish line. I accelerate to 4:30min/km pace, not necessarily because I know whether there were any 34k runners around that I still want to beat but rather because I want to finish strong with nothing left in the tank. I cross the finish line in exactly 3 hours and 20 minutes. As I go across the line, I hear the announcer say I’m in 46th place, which is a positive surprise. Prior to the race, I had mulled over several potential goals. The first had been to merely finish. I guess I accomplished that, without any drama. The next major goal had been to finish in less than 6:00min/km pace. Whether I accomplished that depends on what data I take into account. According to the official timing, the race took me 3:20:00 from starting line to finish line, which along with the official distance measurement of “34k” translates to a speed of 10,50km/h according to the results. Converted to min/km, that would be 5:42min/km. However, according to my GPS watch the race was 32.62km, or around 1.5km shorter than advertised. Along with the 3:20:06 elapsed time that I recorded on my watch, that gives me an average pace of only 6:08 min/km. So according to the official results, I reached my pace goals; but according to my GPS watch I didn’t. Still, considering aid station stops and traffic congestion, I guess I can mark that as “accomplished”. By placing 46th out of 237 finishers, I placed on the first page of the official results. Being on the first page of a results page is fairly meaningless statistic, but for someone like me who’s not a natural-born trail runner and is now aged past his prime anyway, it gives me something a little more realistic to shoot for rather than podiums or top-ten placings that are entirely unreasonable. So that’s another meaningless goal that I reached. Prior to the race I thought that it would be a very unreasonable goal to shoot for a sub-3 finish time. I confirmed that by missing this mark by 20 whole minutes. There’s no way I could have shaved 20 minutes off my finish time this year, but with some more training I feel like it’s a growth target I could aim for again if I were to return in subsequent years. In summary: My clothing and shoe choices worked very well. My hydration strategy was solid. My race execution and pacing was decent enough. 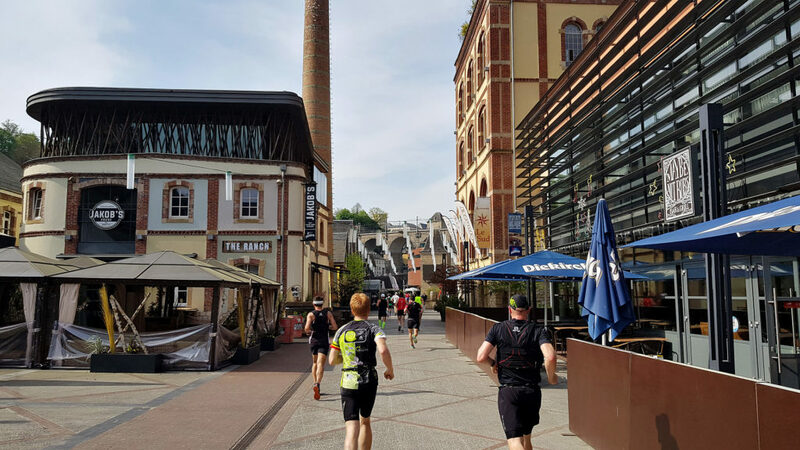 With temperatures of up to 27°C on the race course, I was obviously only wearing shorts (Ronhill Cargo tights) and a short-sleeved shirt (Salomon Agile). Both worked well. I only had minimal chaffing on my legs, and no chaffing whatsoever on my upper body. The beauty of the Ronhill Cargo tights is that they can carry a lot of gear. I had a 0.5 Liter Salomon soft flask in the back pocket, my Samsung cell phone and car keys/ID/spare money in the two left pockets; and some Tempo paper tissues and 4 gels in my two right pockets. 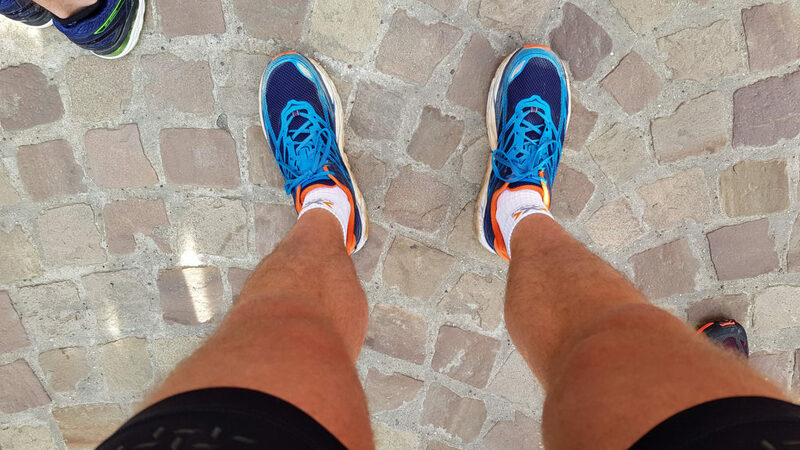 The Hoka One One Clifton 3 were very good to my feet, and at no point did I wish for more aggressive thread or more support. I had no blisters at the end of the race. My left achilles tendon was mostly unremarkable throughout the race and during the following days; even though it’s always my weakest spot. My hydration strategy was solid. I may have lost a bit of time by having to wait for the aid station volunteers to refill my water flask, but with one exception I was not thirsty while on the race course. I consumed about 3 liters of water during the race. I had also hydrated well before the race. After the race, I kept refueling. This allowed me to have a productive remainder of the day; where I did two sports photography assignments without any ill effects from the race. I was able to commute 45km to work and back on my bike the next day. As for my race execution, I don’t feel like I went out too hard; nor do I think I could have done much better at any point of the race given the amount of training I had put in. With no run longer than 23km during the preparation phase leading up to this race, it was inevitable that there would be some slow-down beyond the 27km point. The only way to have significantly improved the race would have been to log more miles, and to do several long runs of 30km; which in turn would have increased the probability of injury and/or of excessive fatigue. The only minor equipment annoyance that I encountered was that while I wore a chest strap to monitor my heart rate, I had disabled that sensor on my watch the previous day; so the actual heart rate data came from the slightly more inaccurate optical sensor on the watch itself. The race, especially in its 34k variant, is challenging and hits a lot of photogenic spots. 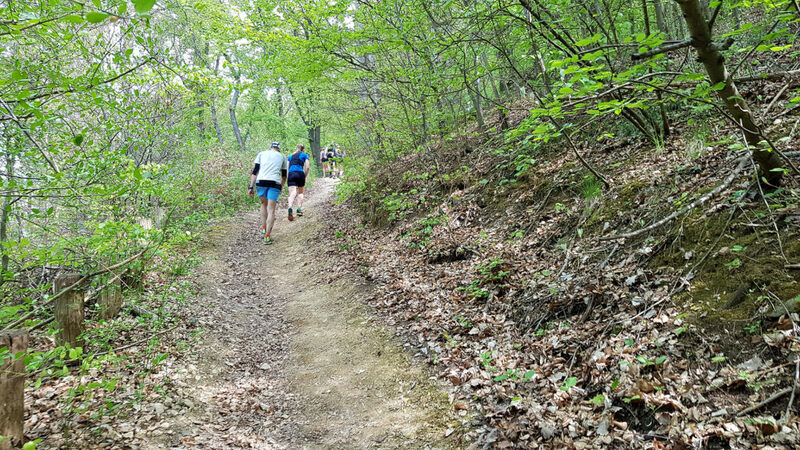 It’s a bit of a stretch to call the 34km race an “urban” trail though, since a large part of the course towards Hesperange is very much a trail run in the forest. But I still think it’s a nice mix, so in the end that’s no big deal. I would have liked to have a more detailed map of the race course. The one on the website was neither complete nor detailed enough, and for my race recon I had to resort to using a Strava activity from someone who ran the previous year. The one big improvement I’d like to see from the race organizers is to further separate the 34km race from the shorter distances. For average runners like me, there’s just too much congestion as I hit the narrowest parts of the course just as the slower runners from the shorter races did. This would also alleviate the issue of the final aid station being too busy. Another thing I didn’t appreciate much is that while there’s official race photographers, they were from an outside company and to actually buy the pictures would have cost me more than the entire race did. That’s a steep price to pay while (judging by the thumbnails) the pictures are of average quality at best. Overall, the race was a positive experience; buta few minor things can hopefully still be improved in subsequent editions. Will I be back? Training for a 34k is a fairly big commitment, but if I can make that fit my life next year, I’ll probably be back.